Royal Navy Destroyer event, without the Destroyers? Am I the only one that finds it odd that we are having a Royal Navy event to celebrate RN Destroyers, without the actual Destroyers being released? Wouldn't this have been a better event if we actually had the DD's. Not exactly as Gallant is available, and three missions to get RN BBs come in crates. RN DDs are not needed for the event in any case. Any T5+ ship will do. The number of threads like this shows you're not. RNDDs were not announced for 7.9 release. They're still in testing and will be released later. It's not the RN DD event, it's the RN DD gambling box event, where WG wants you to go buy the new RN gambling boxes with an (apparently tiny) % chance of unlocking a RN DD so that you can fully participate. Horsetwaddle. All the things that are essential to do, you can do without a Royal Navy destroyer. They get the slightest bit easier if you have one, and you can probably do just as well by playing for crates as buying them. The only thing buying them gets you is more rolls of the dice. I have the Acasta unlock and didn't spend a cent for it. i have gallant but one of the missions blocks RN dds unless you have Tier 7 or higher RN DD. Gallant alone not enough until tech tree RN dd's come out i guess. Stage 3 i think so we have to wait even if we have Tier 6 Gallant? You can get them from personal missions if you are lucky to find one in a box. I'm working on a t-6 DD mission. You don't HAVE to do the RN DD missions/tasks to advance. Read up on it. For that matter, I don't think that any of the RN DD tasks released thus far are tied to crates of Guineas or Sovereigns...just flags. Sep 19th Patch 7.9 starts the event where you can earn Guineas and Sovereigns and if you get a rare drop in an RN container, get an early look at T5-T8 UK DDs. Oct 17th Patch 7.10 releases the full UK DD line and the RN event continues. Nov 14th Patch 7.11 continues the RN Event and Sovereigns are converted to credits and the RN Arsenal leaves the game. SPEND your Sovereigns by Nov 13th. Jan 9th patch 8.0 drops and Guineas are converted to credits. SPEND your Guineas by Jan 8th. Here is the RN event broken down. It gets old pretty fast listening to this same defense of WG's decisions. "I'm ok with it, so there's no problem". Same crap, over and over and over. WG added those gambling boxes because they wanted people to buy them. The only unique drops in them are the chance to unlock the British DDs early. Why bother with the rest of the event? Every good drug dealer knows: Gotta give the first hit free to hook your customers. And no, just because what WG is doing isn't as bad as what Destiny or Overwatch are trying to pull doesn't mean it's not bad. If you hate WG so much, why do you stay? You can complete ALL four Directives WITHOUT a UK DD. You do know that WG has to make money to keep the servers running, the forum up, new content coming and the like right? IF you hate businesses making money, you could move out west and live on Government land for free. You don't need to buy them. I didn't buy any and got Acosta's mission. Just play the game, open the boxes you earn. The event is to earn most of Cossack, which can be done without using any RN DDs. This Pre-Line Release Event is being handled just like the French BB one. There were no free French BBs being given out. I will say that I highly anticipated French BBs and bought some of those crates and got the mission unlocks for all of them, Bretagne thru Richelieu, and I considered myself d*mn lucky. Richelieu was a highly desired mission unlock and guys did not get that despite forking out some good coin to *try* and get her. Current event is the same. The difference this time is I'm ambivalent about RN DDs, so I'm just paddling along as normal. WG came quite far without gambling in their games. Unless you can prove otherwise, WG isn't doing this because they can't keep the servers up and new content coming. WG is doing this because the owner wants another Ferrari. You don't have to buy the RN containers. You can earn RN containers IN GAME, without a UK DD, that have the same early access UK DD drops that are in the containers in the shop. There are other things in the containers that people like to buy like draconic flags, so people are getting more that just the chance at a mission drop. Plus you get Sovereigns for things in the UK Arsenal. Don't forget to change out your tin foil hat every day. @intixw Look, I have not bought a single RN container in the shop and got the Acasta mission from an in-game container. as for containers for a royal navy premium container you need a t7 or t8 uk DD so for all the people that say you don't there it is. If they want to do this fine allow us the chance to rent a ship that qualifies not pay 40 bucks or more for a ship for 1 or 2 missions and never use it again. Or make it so any UK ship can complete the missions. But what you are missing is that you do not have to complete that Mission to complete the Directive. So you do not need a T7+ DD for the event. You can get the early access missions for UK DDs in the containers you can earn with any ship. I know you can as I just got one. I have not bought ANY RN containers from the shop. Oct 17th, the full UK DD line will be released, so you will have access to ALL the UK DDs then whether or not you get any early access missions. 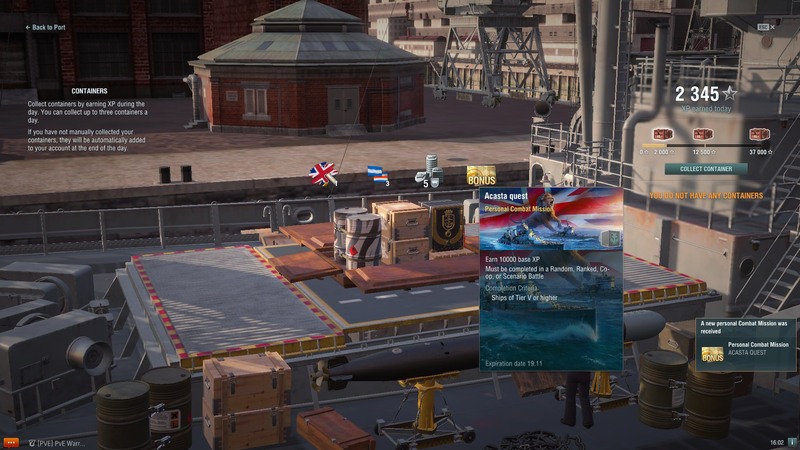 If you want a Royal Premium container you need a t7 UK DD. Or if you are a completionist like some of us are you can not complete the mission. I should not have to buy anything as it is a free game. Even if I have spent more money on this game than all of my AAA titles. Well the game is free to play, not free to develop. Not everything in the game is free, see premium ships. But you CAN complete the RN event for free as you do not need a UK DD to complete all the Directives. For this patch, if you are not lucky enough to get the T7 Jervis and/or T8 Lightning missions in an in-game crate, then you will not be able to complete everything. Starting Oct 17th, you get the full UK DD line and can get yourself a T7+ DD. Cossack is for sale in the shop for $43.53 and you can complete everything. Are you incapable of reading or thinking? I will say that I highly anticipated French BBs and bought some of those crates and got the mission unlocks for all of them, Bretagne thru Richelieu, and I considered myself d*mn lucky. Richelieu was a highly desired mission unlock and guys did not get that despite forking out some good coin to *try* and get her. "I just ate, so world hunger is solved". At least one T7 mission in Stage 1, Directive 3 has a standard RN crate attached. But so many more are available by other means that I find it nothing to angst over. My cognition is fine thank you. Of course they want people to buy boxes, they are a business after all. But it is not ALL about the rare drops. You get flags and sovereigns and maybe a drop. Don't go spending other people's money. If they find value in something that you don't, it is not your responsibility to spend their money for them. Many of us, myself included have warned that the early access mission drops are rare and that was before the boxes were released in the shop. If someone buys boxes just to get missions drops they will either be elated or deflated depending on their luck and I would caution them not to buy them if that is what they are looking for, but ultimately, what they spend is on them. You keep trying to call them gambling boxes, but since you are getting the value out of the boxes from the Sovereigns and flags, are you really losing? You got something of game value for the money spent on the box. If you can not see that, then we don't need to continue this discussion.